Soft Feel is the mission and guiding principle of Cowboy Dressage®. It is a wordless, intimate and for some a spiritual communication within the partnership between horse and rider. Soft feel is not only sending messages but having the sensitivity and awareness to feel and receive messages sent by the horse. The timing and use of the release, relaxation, preparation and execution are the fundamentals of Soft Feel. 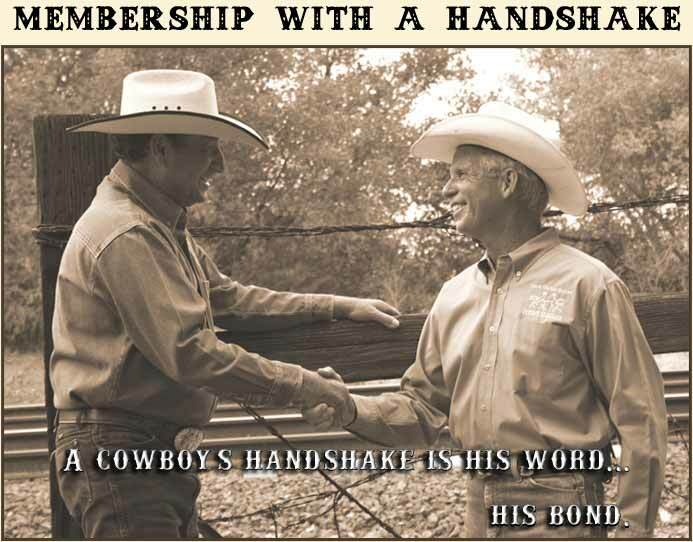 A grassroots movement within the horse industry suggests many of us yearn for the “good ol’ days” when a handshake and a person’s word was his bond. It is a code of honor still practiced by some horsemen and horsewomen today. Yet for most folks, a contract is regarded as a necessary tool of doing business. An entire generation is missing the feeling of pride of being known as a person whose handshake and word is as reliable and ironclad as a written legal document. Cowboy Dressage® is growing nationally and internationally. We are humbled by the enthusiasm it is generating and its enormous projected inﬂuence on the equine community. Such rapid expansion, while exciting, also places our sense of being a close-knit community and our grassroots identity in jeopardy. And while no formal Cowboy Dressage organization currently exists, we believe we need a meaningful gesture that signiﬁes our commitment to our shared values, vision and to one another. ~ continue to educate and teach as much as possible in all formats. ~ keep Cowboy Dressage simple and uncomplicated. ~ provide tests, rules and information to everyone who wishes to show. ~ support and educate individuals outside the show ring who want to learn and improve as horsemen and women. ~ strive to maintain Cowboy Dressage as a grassroots, community-focused movement. ~ ensure Cowboy Dressage is accessible to everyone regardless of their income or status within the horse world. Whether they show, trail ride, barrel race, cut, rein or just love horses, this will be a place they can hang their hats and be proud. ~ and most of all, to look for “the try” in you, the Cowboy Dressage World members. ~ become the person others can trust with a handshake and your word. ~ exemplify the Cowboy Dressage way of life and ﬁnd the courage to chase your dreams. ~ not allow defeat when faced with setbacks in your life and your horsemanship. ~ treat all horses and people with integrity and kindness. ~ look for “the try” in your horses and always reward them. ~ look for “the try” in people as you travel down your horsemanship path. You will get an email to confirm your membership. You must reply to the email to complete your membership. Click Here to take the FREE Handshake Membership!